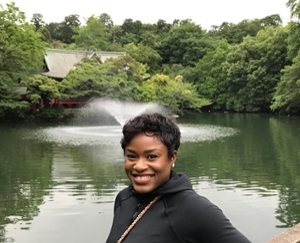 Holly Okonkwo is an assistant professor of cultural anthropology who will start at Purdue in January 2019. Okonkwo received a Ph.D. from the University of California, Riverside in 2015 and is now completing a postdoctoral fellowship in the Interdisciplinary Research Incubator for the Study of (In)Equality (IRISE) at the University of Denver. She is an applied anthropologist and critical science and technology scholar. Her research explores the situated knowledge production of women of the African diaspora and the material and cultural practices of scientific knowledge production, learning and innovation, with special interests in computing and engineering. Drawing on black feminism and postcolonial feminist science and technology studies, her research focuses on the politics of race, gender, and the dimensions of place, and how they function as interlocking systems to reconceptualize and preserve racialized, gendered, and colonial divisions of labor. Okonkwo’s current project explores the experiences of women scientists and technologists engaged in local and transnational science and innovation communities in Ghana and Nigeria. Her work has been funded by the National Science Foundation (NSF) Advance Institutional Grant at the University of California, Riverside, the NSF Science of Science and Innovation Policy program, and the NSF SBE Postdoctoral Fellowship.